CS-Cart "Extended categories" modification allows you to add products in such categories as New arrivals, Bestsellers and Coming soon in your CS-Cart online store automatically. It is a very convenient way to inform customers about the newest products, the products that have a large and rapid sale and the products that will go on sale soon. the products in the Coming soon category will be shown according to the set status on a Product details page. “New arrivals” Category IDs - Type in the ID number of your New arrivals category (ID number is shown in the category url). Don’t forget to create the New arrivals category in the admin back-end first (Products -> Categories). Days - type in the number of days during which products are considered to be new. For example, if products are considered to be new within 4 days after the date of a product creation, type in 4 in this field. Show label “New” - tick this checkbox if you want a label “New” to be shown in a product grid near a new product image in the New Arrivals category. “Bestsellers” Category IDs - type in the ID number of your Bestsellers category (ID number is shown in the category url). Don’t forget to create the Bestsellers category in the admin back-end first (Products -> Categories). Minimal quantity of sold items - type in the minimal quantity of sold items. As soon as the product gets this number of sales, it will be included in the Bestsellers category. Show “Hot” label - tick this checkbox if you want a label “Hot” to be shown in a product grid near a Bestseller product image. “Coming soon” Category IDs - type in the ID number of your “Coming soon” category (ID number is shown in the category url). 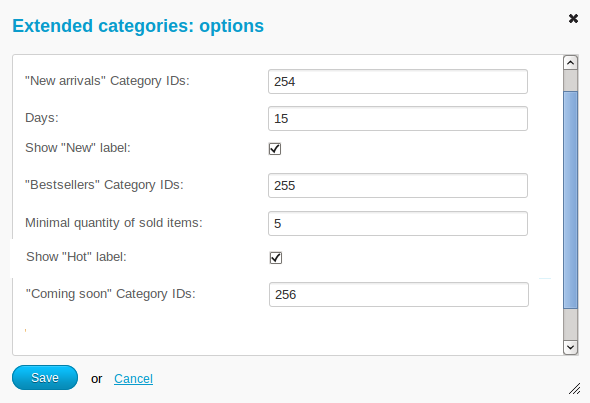 Don’t forget to create the Bestsellers category in the admin back-end first (Products -> Categories). On a product details page in the Availability section (General tab) choose the date in the Avail since field or choose Buy in advance from the select box opposite the Out of stock actions. How to update the categories? 1. Go to Products -> Categories -> choose the necessary category. On the editing category page, go to the Add-ons tab. 2. Click the link Update products in this category to update the category automatically. Products will be refreshed in the category. Is it possible to set up a cron job for the automatic categories update? Yes, it is possible. Cron job script is located in [CS-Cart dir root]/newest.php file. Ask your system administrator to set up a cron job on your server or we can do it for you. We will need a temporary access to your Cpanel. Now we are ready to implement this CS-Cart modification for $200. Please, contact us if you are interested in such a modification. For CS-Cart 4.0.3. this modification will cost $350. Please, contact us, if it works for you."